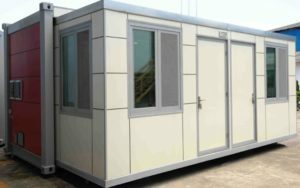 The transportability of shipping containers means that the buildings can easily be moved around whilst the classic, standard shape make the units easily stackable to create multi-story solutions. 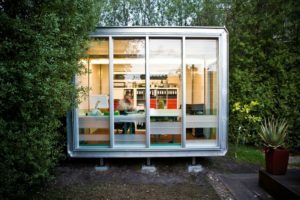 The full steel structure of the container combined with internal insulation means that the building will be able to withstand even the harshest climates – and rigorous moving around. 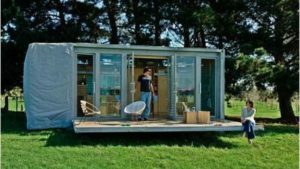 Whether you decide to have a house that can be picked up at a moment’s notice by truck or take a few days to remove piece by piece, a relocatable house by using shipping containers is the easiest way to go. Only external plugging to things such as electricity, water and waste. Fully functional bathroom? Make sure to have everything packed away! Get a large LCD TV screen which can doubles up as a personal computer – that is bolted to a wall. All wardrobes, storage areas, over head cupboards shut and lockable. If you have a porch, or veranda, make it easily detachable or foldable to the side of the container. All this creates the ability to prepare for a storm within 2 min if required!